The Human Rights Consortium, one of the applicants in the Agnew & Others legal case has today welcomed the UK Supreme Court’s decision which accepted its argument that the Government cannot trigger Article 50 without parliamentary legislation. ‘The Consortium became involved in this legal case because we are deeply concerned about the risk that exists of entering into a process to withdraw from the EU without ensuring that important human rights protections, emanating from our membership of that Union, are first safeguarded. Those safeguards are important elements in the Northern Ireland peace process and need to be protected. 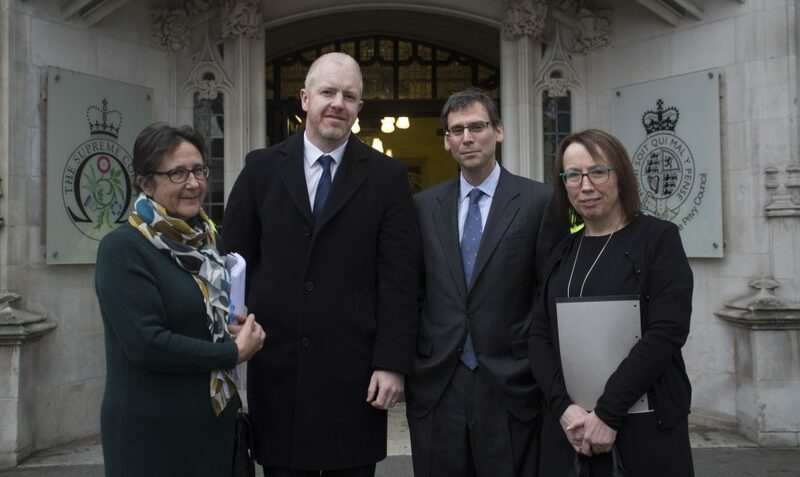 L-R Beverly Jones (Jones Cassidy Brett Solicitors), Kevin Hanratty (Human Rights Consortium), Daniel Halberstam (Jones Cassidy Brett Solicitors) & Fiona Cassidy (Jones Cassidy Brett Solicitors) pictured outside the Supreme Court in London. Like the Miller case we argued that the government could not trigger Article 50 to initiate UK withdrawal proceedings from the EU without the consent of Parliament and the Supreme Court has upheld this point. ‘Northern Ireland now finds itself in a particularly perilous situation with regard to the protection of human rights. We face the combined threats of a removal of EU rights protections through Brexit, the threat to the Human Rights Act and withdrawal from the European Convention of Human Rights. We face these threats without the full protection that the Belfast/Good Friday Agreement was to afford us, most notably through a local Bill of Rights. Undermining these rights can only be seen as a fundamental threat to the principles of the Belfast/Good Friday Agreement. In this context, it is imperative that the UK Government respect the important constitutional and political principal of legislative consent from the devolved Assembly throughout the Brexit process. Furthermore, the important upcoming work to re-establish the Northern Ireland Assembly must address the proper implementation of human rights, including through prioritizing a local Bill of Rights.